Pioneer has just announced a brand new rekordbox controller, aptly named the DJJ-1000 it inherits the mixer and deck’s from the NXS2 series. 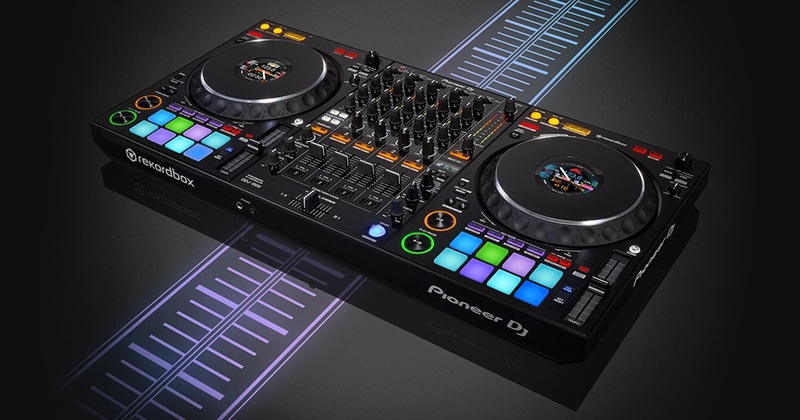 Featuring high-definition LCD screens on the jog wheels displaying BPM, waveform and more; a new track selection assistant called Related Tracks; 14 Beat FX; an improved Magvel-Fader; and 16 multi-coloured Performance Pads which be be used to deploy loops, samplers, key shift and more. Evolving from the DDJ-RZ series which it’s most comparable to, the 1000 features a four-channel mixer and two media players into a portable package designed for use outside of clubs. It’s made to get the most out of the new version of Pioneer’s rekordbox dj performance software, which features an expanded Related Tracks sorting system, improved audio analysis and an Automix function. It has a few unique features that probably hint at the development of other Pioneer products, perhaps CDJ’s with performance pads, you can watch the video above if you want to see Pioneer DJ’s full overview of the unit. Here’s our low down on it’s various sections. Full sized CDJ2000NSX2 jog wheels with platter weight adjustment is a very nice touch to have on a controller, making it completely club grade, although the little display inside seems a bit busy. These show a lot of information, including a waveform, cue and loop points, and BPM. You can apparently customize the information shown. It retains all the information including the phrase meter. The decision to have dual browse knobs seals the deal in the foray of making controllers as robust as their standalone counter parts. With the new Key Shift feature automatically change the key of your next track to match the master deck and shift keys up or down to mix any combination of tracks in perfect harmony. Inheriting all the vital effects and the NSX2 series layout, Pioneer have thrown in 4 new beat FX. The Dual USB was first introduced on the DDJ-SZ. and it’s great to see the DDJ-1000 coming back with this. Every channel on this new controller is switchable between USB A, USB B, and Line/Phono. Magvel Fader: Magnetic crossfader based on the Magvel Fader Pro that comes on the DJM-S9 battle mixer. Rated for up to 10 million movements. Lowest Latency : The video shows a very fluid and smooth scratch routine to back this claim, along with rekordbox’s press release stating the necessary upgrades in the the software. Four deck control: Each deck can be toggled to a second layer to access the other 2 decks, with a light indication. Slip Reverse: Its the default reverse button behavior on the DDJ-1000, in Slip Mode once you let go of reverse, the track picks back up exactly where it would have been, keeping your phrasing locked. Apply FX and change the order of tracks during Automix.